Elegant Heritage™ Fiberglass Doors are available in a wide variety of embossed and flush designs. 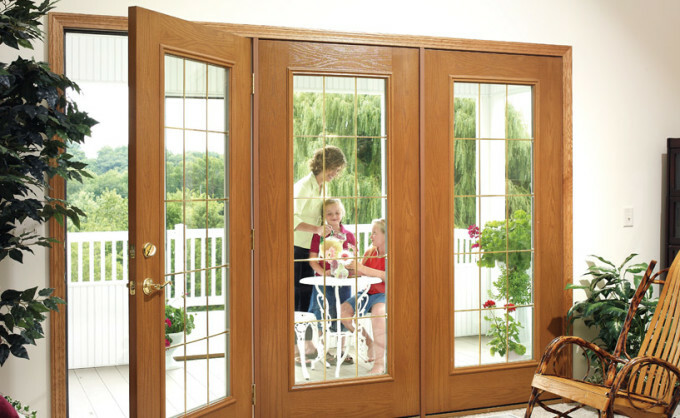 Sidelites and patio doors are also available in the Fiberglass program to meet your entryway needs. This product features enhanced woodgrain texture, improved definition embossing, and a superior oak edge design to prevent warping. The ProVia entry door program consists of doors, patio doors, sidelites and transoms for a wide variety of style and glass combinations to meet virtually any entryway need. Entry Doors: With a wide variety of door styles and glass combinations you can find a door to fit any of your front, back, side and garage entry door needs. Patio Doors: Choose from full-glass double or triple patio door units for your patio door needs. Sidelites: With a wide variety of sidelite styles and glass combinations you can find a sidelite to accentuate your front entry. Transoms: Choose from rectangle, ellipse or half-round transoms in a variety of glass styles from clear to decorative. ProVia Entry offers a wide variety of glass styles ranging from standard clear glass to 15 collections of decorative glass to accent any entryway. Clear Glass: Warm edge 1″ clear glass offers the following features… Lifetime Limited Clear Glass Warranty. Includes glass breakage and seal failure; The Monarch IG glazing system uses a metal-free structural foam spacer between two panes of glass; The warm edge construction gives you superior resistance to heat transfer through the glass; The structural foam flexes to keep a tight thermal seal as it expands and contracts with the changing weather. Decorative Glass: The true magic of decorative glass is created by the refraction of light through each glass panel. Highly skilled craftsmen assemble hand beveled glass accented with a variety of unique glass options by precisely cutting, mitering and soldering each component into artistically designed patterns. ProVia entry is proud to bring you the spectacular – whether it’s the textural beauty of fine art glass, intricate sand carving, precision-shaped brass, zinc, or patina caming, or the prisms of light from handcut bevels. It has all been done with one prize in mind; to create the most memorable architectural glass in the world. Add finishing touches with options, hardware and accessories. Like a fine piece of jewelry, ProVia entry’s hardware and accessories enhance the beauty of their entry systems. Choose from a wide selection of locksets, deadbolts, electronic access products, entrance handles, and more, to complete the perfect entry system for your home.